WMS, a famous software developer, launched a video slot titled Zeus in 2014.Take advantage from Wild Substitutions and a Free Spins Game where up to 100 free spins await you to help you obtain massive wins. The game showcases standard visuals and sounds, alongside with a good win potential and a leveled out RTP of 95.97%. What additionally increases the appeal of the slot is the maximum payout which stands pretty high at 250,000 coins. The reels are home to theme-related symbols, with the mighty Greek God Zeus representing the most profitable icon that delivers 2,500 coins for 5 of a kind. Other high-win symbols include the winged horse, Pegasus, which rewards players with a hefty sum of 2,000 coins if 5 appear on a winline. Landing 5 Boat or Helmet icons will grant you a 1,750 coin prize, while a Harp or a Vase combination of 5 provides a payout of 1,250 coins. Low-value symbols are depicted with Gold and Silver coin and a Wrath that will award between 750 and 1,000 coins when 5 hit a payline. 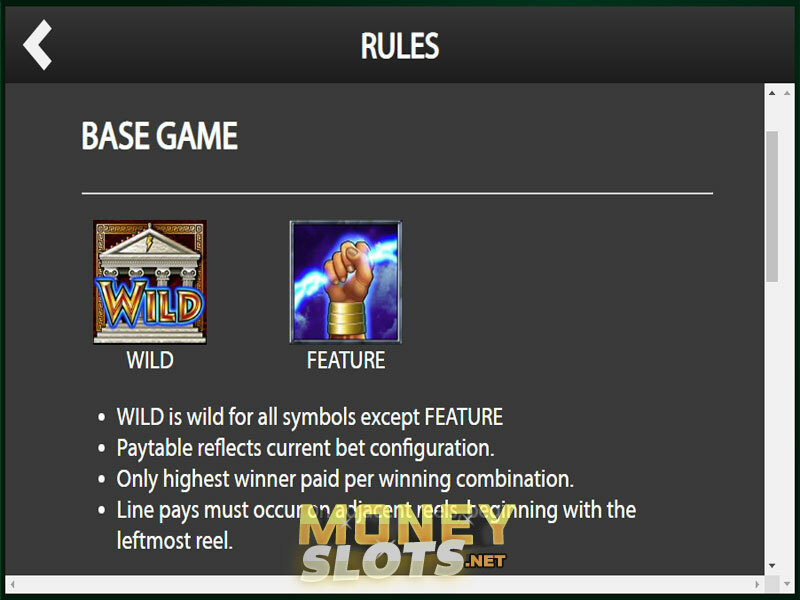 Wild is depicted with a Greek Temple which will step in to replace any icon in forming win combinations, except Scatter. Scatter is in charge of triggering the Free Spins Round and is depicted with Zeus’s fist grasping a lightning bolt. Zeus has a standard 5-reel, 3-row layout offering players 30 paylines to wager on. You are to select the number of lines you wish to bet on and choose the amount you want to stake. Press “+” and “-“to increase or decrease the line bet, ranging from $0.01 to $5.00. In this way you will adjust the total bet to be from $0.01 to $150.00. Click on the Spin button to start the game and wait for the symbols to appear on adjacent reels on a payline beginning with the leftmost position so that they award payouts. To relax while the reels spin on their own for up to 200 rounds, enable Autoplay. To activate the Free Sins Feature you should obtain at least 3 Scatters anywhere on the grid. You will be awarded from 10 to 100 free spins, depending on the number of triggering Scatters. If 3 or more Scatters hit the reels during the feature, you will be granted extra free spins. Zeus will have you coming back for more, as the possibility to obtain 100 free spins sounds more than gratifying. Not to mention that this feature can be retriggered and thus significantly increase chances of mega wins. You can play this slot on desktop, tablet and mobile alike, as it has recently been optimized for play on portable devices.